Narcissistic bosses, leaders, gurus, teachers, doctors, therapists, judges, or law enforcement officers tend to abuse the authority vested in them. Are narcissists in position of authority more likely to take advantage of their patients/students/subordinates? Being in a position of authority secures the uninterrupted flow of Narcissistic Supply. Fed by the awe, fear, subordination, admiration, adoration and obedience of his underlings, parish, students, or patients – the narcissist thrives in such circumstances. The narcissist aspires to acquire authority by any means available to him. He may achieve this by making use of some outstanding traits or skills such as his intelligence, or through an asymmetry built into a relationship. The narcissistic medical doctor or mental health professional and his patients, the narcissistic guide, teacher, or mentor and his students, the narcissistic leader, guru, pundit, or psychic and his followers or admirers, or the narcissistic business tycoon, boss, or employer and his subordinates – all are instances of such asymmetries. The rich, powerful, more knowledgeable narcissist occupy a Pathological Narcissistic Space. These types of relationships – based on the unidirectional and unilateral flow of Narcissistic Supply – border on abuse. The narcissist, in pursuit of an ever-increasing supply, of an ever-larger dose of adoration, and an ever-bigger fix of attention – gradually loses his moral constraints. With time, it gets harder to obtain Narcissistic Supply. 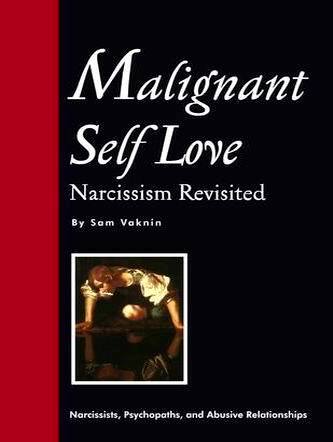 The sources of such supply are human and they become weary, rebellious, tired, bored, disgusted, repelled, or plainly amused by the narcissist's incessant dependence, his childish craving for attention, his exaggerated or even paranoid fears which lead to obsessive-compulsive behaviours. To secure their continued collaboration in the procurement of his much-needed supply – the narcissist might resort to emotional extortion, straight blackmail, abuse, or misuse of his authority. The temptation to do so, though, is universal. No doctor is immune to the charms of certain female patients, nor are university professors asexual. What prevent them from immorally, cynically, callously and consistently abusing their position are ethical imperatives embedded in them through socialisation and empathy. They learned the difference between right and wrong and, having internalised it, they choose right when they face a moral dilemma. They empathise with other human beings, "putting themselves in their shoes", and refrain from doing unto others what they do not wish to be done to them. It is in these two crucial points that narcissists differ from other humans. Their socialisation process – usually the product of problematic early relationships with Primary Objects (parents, or caregivers) – is often perturbed and results in social dysfunctioning. And they are incapable of empathising: humans are there only to supply them with Narcissistic Supply. Those unfortunate humans who do not comply with this overriding dictum must be made to alter their ways and if even this fails, the narcissist loses interest in them and they are classified as "sub-human, animals, service-providers, functions, symbols" and worse. Hence the abrupt shifts from over-valuation to devaluation of others. While bearing the gifts of Narcissistic Supply – the "other" is idealised by the narcissist. The narcissist shifts to the opposite pole (devaluation) when Narcissistic Supply dries up or when he estimates that it is about to. As far as the narcissist is concerned, there is no moral dimension to abusing others – only a pragmatic one: will he be punished for doing so? The narcissist is atavistically responsive to fear and lacks any in-depth understanding of what it is to be a human being. Trapped in his pathology, the narcissist resembles an alien on drugs, a junkie of Narcissistic Supply devoid of the kind of language, which renders human emotions intelligible. Minorities or "others" - often arbitrarily selected - constitute a perfect, easily identifiable, embodiment of all that is "wrong". They are accused of being old, they are eerily disembodied, they are cosmopolitan, they are part of the establishment, they are "decadent", they are hated on religious and socio-economic grounds, or because of their race, sexual orientation, origin ... They are different, they are narcissistic (feel and act as morally superior), they are everywhere, they are defenceless, they are credulous, they are adaptable (and thus can be co-opted to collaborate in their own destruction). They are the perfect hate figure. Narcissists thrive on hatred and pathological envy. This is precisely the source of the fascination with Hitler, diagnosed by Erich Fromm - together with Stalin - as a malignant narcissist. He was an inverted human. His unconscious was his conscious. He acted out our most repressed drives, fantasies, and wishes. He provides us with a glimpse of the horrors that lie beneath the veneer, the barbarians at our personal gates, and what it was like before we invented civilization. Hitler forced us all through a time warp and many did not emerge. He was not the devil. He was one of us. He was what Arendt aptly called the banality of evil. Just an ordinary, mentally disturbed, failure, a member of a mentally disturbed and failing nation, who lived through disturbed and failing times. He was the perfect mirror, a channel, a voice, and the very depth of our souls. The narcissistic leader prefers the sparkle and glamour of well-orchestrated illusions to the tedium and method of real accomplishments. His reign is all smoke and mirrors, devoid of substances, consisting of mere appearances and mass delusions. In the aftermath of his regime - the narcissistic leader having died, been deposed, or voted out of office - it all unravels. The tireless and constant prestidigitation ceases and the entire edifice crumbles. What looked like an economic miracle turns out to have been a fraud-laced bubble. Loosely-held empires disintegrate. Laboriously assembled business conglomerates go to pieces. "Earth shattering" and "revolutionary" scientific discoveries and theories are discredited. Social experiments end in mayhem. Thus, a narcissist who regards himself as the benefactor of the poor, a member of the common folk, the representative of the disenfranchised, the champion of the dispossessed against the corrupt elite - is highly unlikely to use violence at first.